MARGARET EXPLOSION: SKYHIGH. This is one of the most original and unusual bands in Rochester; a five-piece ensemble exploring all sorts of musical dimensions linked to free jazz, Third World melodies, exotic instrumentation and a spacey, enveloping sort of music that often echoes the works of Scandanavian saxophonist Jan Garbarek and other Europeans who record for the ECM label. The 13 tracks on Skyhigh vary from the funk of "Shep's Paradise" (a tribute to the legendary local jazz club), to the geographic tributes to "Ionia" and "Bilboa." Despite the offbeat material, the Explosion plays with a single-minded purpose and organic oneness that's most impressive. The Margaret Explosion's music is infinite, eternally elegant, and mystical. It is a musical journey with no end --- or beginning, for that matter. The Margaret Explosion is slow-motion psychedelia that conjures images and colors. It will awaken things in your head. You will see. The lyric-free lilt the music offers is a more complex and interesting narrative than found in most songs with words; like thoughts in larval from, before they get fleshed out with consonants and vowels. And in this case the narrative belongs to the listener --- as well the band --- for there is no map, no compass, no divining rod. The Margaret Explosion set out as the most unlikeliest of things if you consider what the band sounds like now. The quartet --- Peggi Fournier, Paul Dodd, Bob Martin, and Ken Frank --- had secured Friday happy hours at The Bug Jar in October 1996. "The initial idea before we started playing was we were going to do covers," says drummer Paul Dodd. "But we never came up with any covers and then we had the gig." "When we sat down to do it we just jammed," says saxophonist Peggi Fournier. The gig lasted three years. The Margaret Explosion's home for the past three years has been the Little Theatre Café, where the audience's ebb and flow is contingent on movie times. The band plays comfortably beneath a haphazard symphony of slurps, sips, and the clatter and clunk of silverware and coffee mugs. Pre- and post-cinematic banter adds to the din. Not everyone listens directly. This doesn't rattle the Explosion. "No, we like it," Fournier says. "We like to be background." 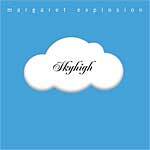 The Margaret Explosion has just released its third CD, Skyhigh.Skyhigh was recorded live in the band's basement studio. And in much the same way the band plays live, the songs were written as they were being laid to tape. "They were all spontaneous," says Fournier. "The first time we ever did those songs was when we were recording them," adds Dodd. "We just count and go," says guitarist Bob Martin. Then he reconsiders: "We don't even count. We just go." When artists jam, someone typically holds the baton; there is a framework. The Margaret Explosion doesn't have one. It's the blues without the bones. "We call what we do simultaneous, spontaneous composition rather than jamming," Martin says. "And it's a huge difference." The key to The Margaret Explosion's exploratory freedom is the fact that its members hang on the one; there are virtually no chord changes. Yet they keep it interesting somehow. The narcotic push and pull of Dodd's drums with Ken Frank's casual camel-in-a-caravan bass walk combine with Martin's lush wash of six-stringed layers that suggest a big, big sky. Fournier's soprano sax undulates like smoke. This is where melody merges with atmosphere. "Fortunately Peggi's in the band," Martin says. "Otherwise it would sound pretty boring." And when Martin solos, extant melodies sometime bubble to the surface. It's like faces in the sky; you stare at clouds long enough you're bound to see someone you know. "If I sorta hear it in there, I'll play with it a little bit," Martin says. "It's kind of a staple of jazz; to quote a melody and move past it. It's very subtle never over the top." Despite the sonic expeditions and excursions to anywhere, The Margaret Explosion does have a vague idea of what the music requires and how they can keep it fresh. "There is certainly a pattern to what we do," Fournier says. "I'm sure a lot of people think everything we do sounds the same. We do try to make some variations." 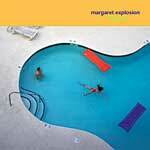 Variations not withstanding, the core Margaret Explosion sound is eerie and dreamy and picturesque. You can thank the minor keys for that. "It's a very happy minor," Martin says. The Margaret Explosion celebrates the release of Skyhighwith guest pianist Pete LaBonne and assorted circus performers, Wednesday, November 29, at The Little Theatre Café, 240 East Avenue, 258-0412, 7:30-9:30 p.m., free. Videographer Duane Sherwood will also premiere his video interpretation of the band's tune "4 A.M."
As I said a while back in reference to our own brilliant Respect Sextet, jazz is the truth, albeit an interpretive truth. And though I have no aversion to the truth, I prefer my own version. Listening to jazz bands like Margaret Explosion – which has a residency at the Little Theatre Café – helps me get there. The band started playing last Wednesday even as the members slowly assembled on stage, each member gradually joining the others. There were no words other than those already in my head. It was cool and beautiful and dreamy and you have no idea what I'm talking about, do you? 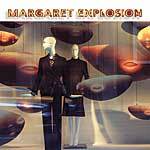 (November 22, 2006) — Words to explain the Margaret Explosion are startlingly elusive, even for the band itself. "Bob was trying to describe it to somebody," drummer Paul Dodd says of guitarist Bob Martin, "and I watched him fumble all over the deal." Alas, Dodd proves to be no more adept at painting the picture. "Peggi, help me out on this," he calls out to his sax-playing wife, who gets on the phone. "The music comes out the best when we're listening to each other and playing off each other," she says. "Responding to little subtleties that take us down a track we didn't expect to go down." Well, that's more the means to the end. The Margaret Explosion is unrelentingly cool jazz. Within its Beat Generation beat, there is an element of cocktail music for zombies. And a strong David Lynch hallucinogenic factor. Sleek and translucent as the steam rising from your hot coffee. Whatever it is, the Margaret Explosion celebrates the release of its third album, Skyhigh, at 7:30 p.m. Nov. 29 at The Little Theatre Café. Manson-bearded pianist Pete LaBonne will make the five-hour drive from his un-electrified house deep in the Adirondack woods to ensure us of the full Margaret, which is him, Peggi, Paul, Bob and bassist Ken Frank. The evening will also include a display of artistic juggling by Airplay With Just Foolin' Around, and a showing of a video for Skyhigh's songs, 4 a.m. The Margaret Explosion was born out of the Dodds' mid-'90s happy hour gigs at the Bug Jar. "We were just gonna play cover songs; we weren't gonna rehearse," Paul says. "It's just what came out." Not a cover band at all, but one drive-by jazz-minded improvisation. And one that delves deeper into the minor keys than the Dodds' '80s rock band, Personal Effects. "It's spiritual," says Peggi. "Because of the way that we play, you get in the zone. It's really relaxing, great after a stressful day. "We record everything we do, and when we listen to it, we'll say, 'Oh, let's re-create it.' But we couldn't. "It would never be as good as the first time." It's jazz as a juggling act; the songs have structure, but a mind of their own. "I think we all kinda thrive," Paul says, "on that tightrope kinda thing." "Wednesday night found me diggin' on the Margaret Explosion (complete with a re-hydrated and upright Paul Dodd) in the Little Theatre Cafe. I can get sick of just about everything I like, eventually - fried chicken, blondes, The Stones - but not The Margaret Explosion. Their esoteric wonder paints pictures in my head nostop. And I mean cool stuff, too, like a three-legged Little Egypt undulating up to her knees in coconut cream pie, while big bears on little motorcycles circle around singing "doo wah diddy diddy dum diddy do." No drugs, honest, just real good music. Good deserts, too." Rochester's excellent cocktail-atmosphere, appetizer-jazz ensemble, Margaret Explosion, celebrates the release of its second CD, 1969, with a show at 8 tonight at Montage Grille, 50 Chestnut St. So elegant that it's almost not there, 1969 features three former members of the Rochester New Wave band Personal Effects, including Margaret Explosion leaders Peggi Fournier on sax and Paul Dodd on drums. Old Effects enthusiasts will barely recognize "Don't Wake Me," a cut from the band's 1983 album. So I'm sippin' black coffee, Little Theatre Cafe with Margaret Explosion aloft on gossamer wings and complimenting assorted musings. Ray Anthony sounded the charge back to reality and Iceberg Slim came in to add a few snaps and give us all the finger. But I didn't see you there, did I? Not all bands sound good in the Little Theatre Cafe. Sure, it's a tres cool joint, but harnessing the acoustics sometimes proves to be tricky. Margaret Explosion not only harnesses the room's sound, but also throws a saddle on it and rides it around. Even without the Leary-esque visuals, this band is an experiment in texture and color that just works. How, you may ask? Because they sound good. Rooted in dreamy improvisation and just a pinch of post-Beat aesthetic, the band seems to rely on a relatively thin structural framework. They just dive into the 12 cuts on their new CD 1969. Hear them for yourself when Margaret Explosion plays Friday, November 28, at The Montage Grille, 50 East Avenue, at 8pm. One of the big names on Rochester's 80's music scene was a band called 'Personal Effects'. Where are they now? After a half-dozen albums, 'Personal Effects' disbanded in 1987. But you'll find its nucleus in 'The Margaret Explosion'. "I think it was nice to sort of musically take a break, and then come back to it," says guitarist, Bob Martin. "Because we never got like those big bands who hate each other or anything like that," he laughs. Bob Martin, Peggi Fournier, and Paul Dodd have been friends since 'Personal Effects' began in 1980. The band's first album came out on New York City's Cachalot Records in 1982. That label deal was short-lived, due to the group's determination to be in control of its own destiny. "We always fought to do just what we wanted to do," says drummer Paul. The arty band played the East Coast, including NYC's Danceteria, Peppermint Lounge, The Ritz, and the Mud Club. Locally, it drew more than a thousand fans to its big shows at Rochester Community Playhouse and Top of the Plaza. "People still..'Oh, I remember the Top of the Plaza! '," says Peggi. "But those were kind of extravaganzas, and we had liquid light shows, and dancers behind a scrim, and that kind of thing." The 5-year old, stripped-down 'Margaret Explosion' takes the atmospheric sounds of 'Personal Effects' even farther. "(It's) more abstract," explains Paul (who's been married to Peggi since 1976). "I think we all sort of lean that way now... (We're) just looking for something fun to do." You can check out 'The Margaret Explosion' live, Wednesdays through October first at Little Theatre Cafe from 8 to 10pm. Surely Greg Slack is captain of the Barney Ruble bass team. He sits and fires a few low enders to Catcher Dodd. He Paul semaphores pulsation's from the Marcelle Marceau school and Peggi and Bob chew on it masticating former Buddhist incarnation honey tones from the basements infrastructure. I'll bet many will sip a late' not knowing their lips are being sound tracked yet there will be a certain gliding resonance in the engine of the Honda on the way home. I dig it .The only thing I'd say is : say a few words to the audience once in a while. They dig you. 1969 is still playing on my speakers. On repeat. No, I haven't worn it out yet. It has much more discipline and evocative emotion than "Invisible Idiot." I stopped in at the Little Theater show the last evening that you were there. The sound and playing was fabulous -- even better live! Paul's smoothed theatricality on the drums was most impressive, the drum sound slightly more reduced on the CD. When I'm done with it, it goes on the shelve between Coltrane and Jon Hassell. Congratulations! Even my hard-to-please brother-in-law will dig this one. If he still lives. The Margaret Explosion is not screaming for your attention. At its weekly Friday night happy hour gig at the Bug Jar, the band sets up in the darkest corner of the club. It makes no announcements or introductions. The musicians don't take flashy solos, or make grandiose musical statements. What they do, from their dark corner, is provide the crowd with a cool, knowing, improvised soundtrack for its early evening activities. They cast a bohemian glow over the room, and, like magic, people look more interesting, conversations become more engaging, and Rochester seems like a better, hipper place to be. Watch me play taboo with myself. Here are the words that most lazy, ordinary music critics lean on, words I will not use in this description of the Margaret Explosion: dreamy, ethereal, eclectic, lush, David Lynch, wash, soundscape, trippy, hypnotic, waterbed. The Margaret Explosion floats with with an artistic style and grace and a loose, relaxed reference to melody that hints at jazz dissonance, beatnik hipness, and lullaby comfort. Though thoughtful, moody, and peaceful in a leopard print, red-velvet-camouflage, lounge kind of way, the quartet still reveals an underlying sense of personal effect, purpose, and intimidation lurking in their inky noir like a demon in a fairy tale. The Explosion's beautiful saxified music is most akin to that prelude to REM, when we first drift off to ...OK, so maybe they are a little dreamy (gimmie a break). The Margaret Explosion celebrate the release of their new CD, Happy Hour, on Friday, February 28, at The Bug Jar, 219 Monroe Avenue, from 6:30 to 8:30 p.m. Free. 454-2966. Happy Hour Fridays at the Bug Jar have assumed an air of high-brow, art-school dilettante excess. The eclectic bar is filled with baguette ladies and grad students in their 1st year of film study, conducting serious chats over the whisper of ethereal jazz by the Margaret Explosion. The Margaret Explosion is a loose collective of local music scene veterans who produce music that sounds as though everyone was sucking on an ether rag before the show. At the moment, the band is four musicians; five if someone like La-la-land guitarist Phil Marshall sits in. Paul Dodd supplies the bohemian percussion. He’s married to Peggi Fournier who plays a slow, enchanting alto sax, which was a respected jazz instrument until Kenny G turned its music into the official interlude of dentists’ waiting rooms. Dodd and Fournier have been a part of the Rochester scene for more than a decade, going back to the Hi Techs and Personal Effects. Now 47, Dodd remains a presence here, pointing out that “I think I’m still playing in the Ripton Band.” As the Ripton Band hasn’t had a gig or a rehearsal in a while Dodd is a little unsure, but that’s how it goes on the local scene; bands fade in and fade out and fade in again, like a weak radio signal. But the Margaret Explosion, that’s regular employment. The band has played nearly every Friday at the Bug Jar since October 1996. The Margaret Explosion was born when Dodd and Pete LaBonne, who’s living in the Adirondacks, were throwing around ideas for a band that would cover old ‘60s hits such as Hound Dog. But when they booked that first gig at the Bug Jar—the trio didn’t have a name at that point—they threw away the idea of playing other peoples’ songs and improvised jazz all I evening. To this day, the Margaret Explosion—originally conceived as a cover band—has never played another musician’s music. Bug Jar favorites such as Jungle Extraordinaire can be heard on one of the Margaret Explosion’s four live cassette tapes, available at the shows. The band’s improvisational skills came into play the night someone pulled the fire alarm at the Bug Jar. As fire trucks pulled up outside, the crowd migrated to the windows to watch the flashing lights. The Margaret Explosion riffed over the whole thing, and later at its Monday-night rehearsals developed the music into a piece called Fire Engine. So the Margaret Explosion is sort of a communist cocktail mix: Equal parts for everybody, including the people who have shown up for just for the $1 Rolling Rocks. Margaret Explosion is an otherworldly lounge band that played an esoteric weekly Friday night happy hour at the Bug Jar for a year and a half. The ethereal soundtrack they provided cast an often eerie, slow-motion effect on the just-out-of-work crowd's revelries. The group's improvised minor-key melodies bathed the room in a melancholy glow, suggesting old eight-millimeter home movies, and blurring the line between experience and reminiscence." As I remember it, it's all Pete's fault. Pete LaBonne and Shelley were going to be housesitting for the summer in Rochester's South Wedge and we talked about putting a band together while they were in town. This was '97. Peggi and I set up the Friday happy hour slot with Casey at the Bug Jar and we had the gig before we had the band. We asked Jack Schaefer if he was interested and he said he was. We never rehearsed or anything and then Pete was in town before we knew it. So we just showed up at the Bug Jar and kind of jammed. Pete came up with the band name. It was Jack on guitar, Pete on bass. 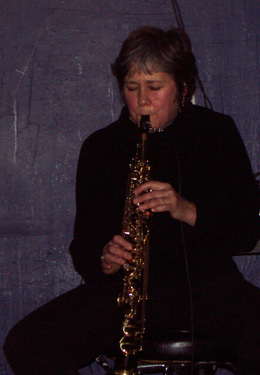 Peggi Fournier on sax. I played hand drums and Shelley Valachovic played the shakers. We played every Friday through the summer and then Pete and Shelley moved back to the mountains. Jack bowed out to spend more time with his family and Greg Slack, who used to play with Lou Grahmn, started playing bass. Mike Rizzo joined on drums and Scott "Fex" Smith sat in on trumpet. This new Margaret Explosion lineup continued playing at the Bug Jar on Fridays for two years. The original Margaret Explosion lineup recorded a cd as Invisible Idiot while the "new" lineup recorded a cd of the songs developed at the Bug Jar entitled "Happy Hour". 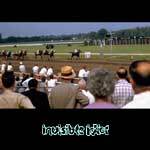 Pete LaBonne, Jack Schaefer, Phil Marshall and Bob Martin all played on Happy Hour. Bob Martin officially joined on guitar in 2003 and he, Peggi, Greg and I recorded the cd entitled "1969". Bob had played with Peggi and me in Personal Effects and it was great to be back with him. Greg left in September, 2004 to play with his church band and Ken Frank, who played with Lydia Lunch before she left town, 5 Star Buffalo, The Flower City 5 and Colorblind James Experience joined us on bass. We always loved Ken's sound and are thrilled to be playing with him. We continue to play Wednesday nights at the Little and elsewhere. We have just released our first cd with Ken, entitled Skyhigh. See reviews of Skyhigh at the top of this page.